In one case, your ears perk up. Answering questions about God is a hobby or profession of yours. Or, in the other case, you immediately wonder where the more qualified people are. Preferably seminary-trained. What’s the difference between these two kinds of people? The first is confident in their understanding of God. The second is not confident in their understanding of God. Now understanding God, like understanding anything else, is of course a good thing. God does make himself known, after all. But the process of understanding God is more a journey in worth of pursuit than it is a destination to which we can arrive. And everybody can and should take this journey. Faith, trust, and a lot of uncertainty. This journey sounds like any fruitful relationship in which what keeps you engaged is the mystery that remains. At the heart of faith, you’ll find that someone is trusted rather than that something is known. Yes, it’s true what was said–“Faith seeks understanding.” But faith does not depend on understanding. Our traditions have given us creeds, doctrines, classes, and sermons. God comes and gives us stories, symbols, questions, and metaphors. After all, shall we remember that one of the most important things to know about God is that most of God is unknowable? God is mostly unexplainable. Even the things that we think we can explain? We can’t. Try explaining grace, for example. A major lesson I have learned recently: I simply cannot do it. If I wanted to be a good theologian (according to the popular definition), that should bother me. But it comforts and encourages me. How is this so? In holding confidence in my understanding of God, confusion leads to bewilderment, and uncertainty leads to strandedness. In confidence in my lack of understanding of God, on the other hand, confusion and uncertainty open up to faith and trust. Instead of some of us having confidence in our understanding of God, on this journey we can all find confidence in our lack of understanding of God. We would all look rather like the people Paul portrays us as in the early chapter of Romans. We are all on the same level. None has an advantage over the other. It would not just be theology “for the rest of us”–it would truly be theology for everyone. A theology that puts us all on an even plane does not come in the form of a simplified version of what is known about God, but an acknowledgement that in our relationship with God, he is always in the process of becoming known. 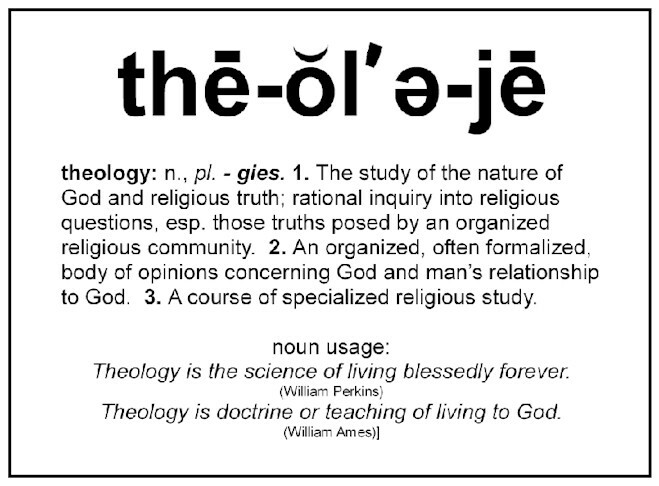 So, if we can tweak the way we use the word “theology” for the moment according to its root terms God (theos) and word or utterance (logos) to denote simply what can be said about God, I’ll join all of my fellow theologians (aka “fellow travelers on this journey”) in admitting that “I don’t understand God.” And I’ll be doing the best theology that can be done.